Since the ancient times architecture has always been at the high epochal influences started from the simple forms of Menhirs at the peak of complication gothic style. During the 5000 thousand years of history had been created almost every form and its extension. The new era of various inventions brought out the issues of cutting edge innovations of paradigmatic field through the Mediums of art, music, poetry etc. The concept of this project is based on my sketch of influenced by the greatest artist Joan Miro. first place the sketch has been drawn second step was creating the model and the third and final step was to sink it into the water. 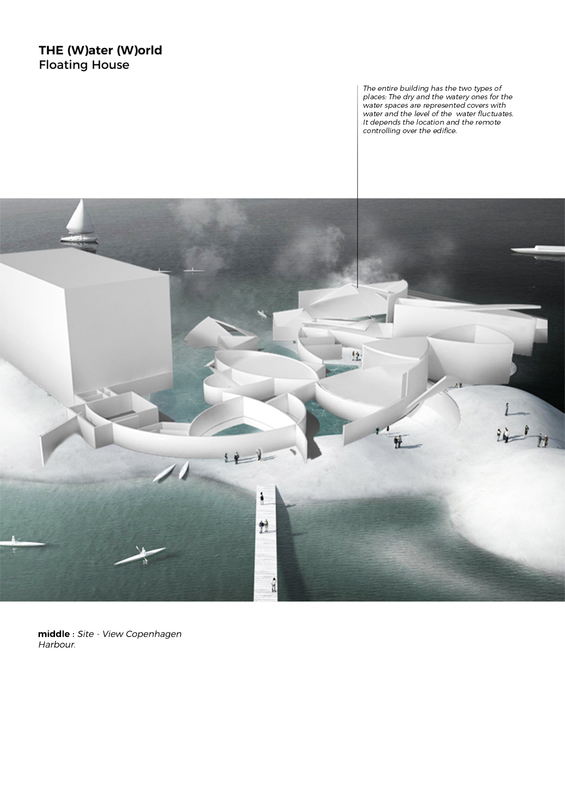 The main concept of the project is to float on the water and sometimes most of the building entirely get covered by water. The project has two plots of uncanny narrative that is the synthesis of the contradicts, as the paradigm of island floats at the surface of water Offers shelter to the visitors. Second of all it gets drawn from time to time. Despite the fact that the Flouting House is motionless water fluctuation grants the feature of its capability of version verity expression. The Floating House is the representation of utopia. with its dystopic surroundings, it can be placed at any watery place to float and sink again over the time gap relevance. it changes every other week or even day. It is representation of rational tissue of the 3-dimensional naive drawing literally translated on architectural "langue" and sunk into the water(s). the edifice has two types of spaces Dry and watery ones. despite the manner of sinking dry spaces always remain untouchable by the water. In a word, the Floating House of Water World is the literal translation of the natural island that floats and some of parts are covered with water and the other part remains in dryness. There are represented some of the paradigms of the history of culture.